The Vinayak Rail Track (I) Pvt. Ltd. Bulletproof Items are fortified positions fabricated from bulletproof Phantom Steel manufactured by Star Wire India Limited. 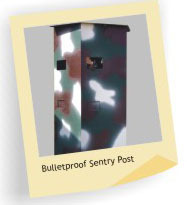 The Sentry Post comes in three distinct variants, each suited to a different operational requirement. 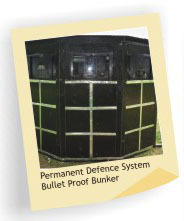 The Bulletproof PD, Bunkers & Sentry Post is made of rugged components and can be erected and dismantled in a short time. With multiple observation and firing slots, the Sentry Post PD & Bunkers are an unparalleled advantage in controlling and denying access to sensitive installations and facilities. 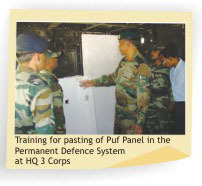 The Vinayak Rail Track Bulletproof PD, Bunkers & Sentry Post provides protection against fire assault of small arms of NIJ Level III rating.